It’s a brave new world of online hotel bookers, hotel technology, and hotel distribution out there. Here’s a glossary of the key players and tech solutions that’ll help hoteliers navigate today’s online distribution landscape and steer their hotels toward business success. Who are the key players and how do they operate? A hotel metasearch like trivago aggregates online content and hotel rates from hundreds of booking sites across the Internet and presents travelers with an unbiased, comprehensive list of hotel deals to choose from, all of which fit their ideal-hotel criteria. A word to the wise: A pure metasearch is not a booking site, but a price-comparison site for travelers searching for hotels. For hoteliers who take control of and optimize their hotel profiles on metasearch, it can be an effective marketing channel and a powerful tool for driving both direct and indirect bookings. An online travel agency, or OTA, is a third-party booking site that sells hotel rooms alongside flights, car rentals, tours, etc. These companies take a commission for each booking and operate similarly to traditional travel agents — except that they’re online. Working with multiple OTAs can help increase a hotel’s online exposure and overall occupancy. A wholesaler is a third-party distribution company that buys hotel room nights in bulk and sells them to OTAs and travel agents. While a wholesaler can help a hotel reach full occupancy, the revenue per available room (RevPAR) through this distribution channel is lower than it is through other channels. What solutions are hoteliers adopting to be competitive in the online distribution landscape? A central reservation system, also called a CRS, is technology for managing and organizing a hotel’s inventory and availability, as well as for opening, closing, and processing reservations. A channel manager allows the hotelier to quickly and efficiently manage room rates, availability, and restrictions across all their connected online distribution channels. It can help the hotelier ensure, for example, that their property is never overbooked. Not technically a piece of technology but rather a supplier of it, a connectivity provider enables hoteliers to capture direct bookings online by providing technology (such as a channel manager or Internet booking engine, which can be customized and branded with the hotel’s logo) and the online connection to advertising channels such as metasearch sites. Working with a connectivity provider can help the hotel reduce its distribution costs and thereby increase its revenue. A CRM system is technology that helps the hotel manage, track, and nurture its relationships with its guests. CRM software collects guest information and houses it in a single database, so that it can be easily accessed and used to improve the guest experience and online marketing activities. Hoteliers find CRM solutions extremely helpful in online reputation management, for example. 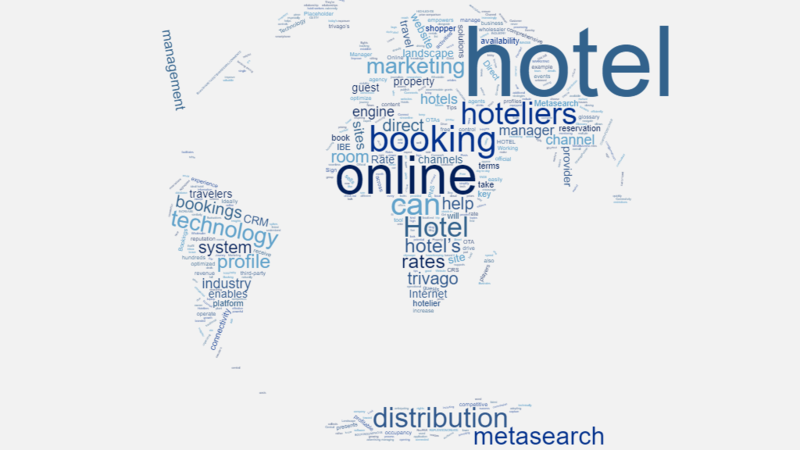 In the online distribution landscape, a hotel’s profile on metasearch is increasingly valuable. With a hotel’s description, details, images, reputation, availability, and rates, the hotel profile presents and promotes the hotel to a growing online audience of hotel-seekers. Who controls the content of a hotel profile? Ideally, the hotel owner or manager. They’re the ones who know their hotel best, after all, and can easily add a hotel profile for their property to trivago for free. An application that facilitates the traveler’s online reservation process, an Internet booking engine (IBE) is what enables hoteliers to drive direct bookings online, especially via metasearch marketing. The growth of online hotel bookings is due in part to the increasing number of hotels with either their own IBE or one provided by a connectivity provider, both of which accommodate and encourage more direct bookings. A hotel’s official website illustrates to travelers what kind of guest experience they can expect if they book a stay — and what perks they will receive if they book directly. Ideally, the official hotel website will also have an optimized booking engine, so that it supports a seamless direct booking journey that yields high conversion rates. To understand how a hotel website can be optimized to drive direct bookings, here’s a look at five hotel websites inspiring guests to book. A metasearch marketing platform is a tool that enables hoteliers to take control of their hotel profiles as they appear on metasearch sites, and to optimize them for greater visibility and booking-driving potential. trivago offers a metasearch marketing platform that empowers hoteliers to build the unique hotel profile that can connect them to the millions of travelers on trivago’s 55 localized sites every month. The operational backbone of a hotel, a property management system, or PMS, enables hoteliers to simplify and streamline all their day-to-day activities from check-in to check-out, housekeeping, and invoicing. A good property management system will be cloud based and include additional hotel technology, such as a channel manager and booking engine. A rate shopper empowers hoteliers to establish competitive, agile, and profitable pricing strategies by monitoring their competitors’ room rates, tracking fluctuations in market demand, and anticipating what local events may bring about profitable spikes in tourism. A comprehensive rate shopper grants the hotelier access to see rates from hundreds of booking sites, including the hotel’s own room prices listed on all its distribution channels.